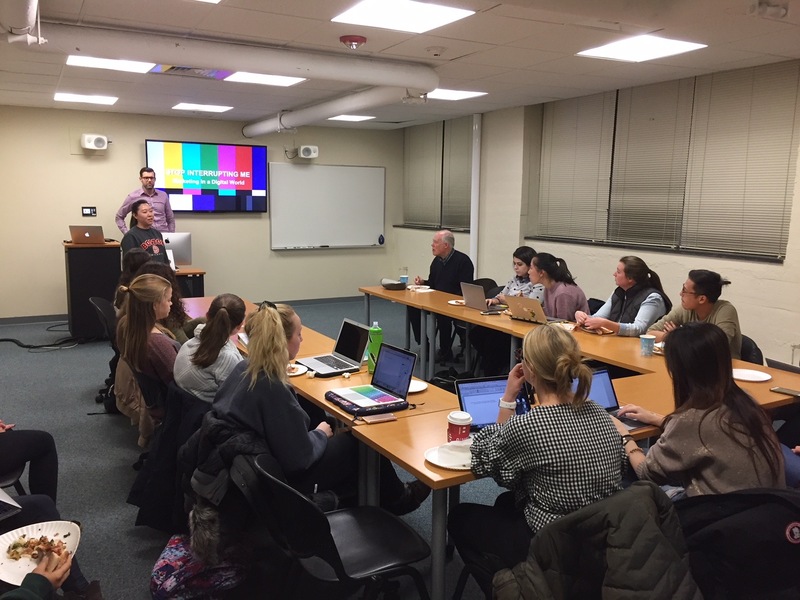 Visiting the College of Communication, Brad Blake, a SVP at HIll Holliday, presents to undergraduate and graduate students about the changing world of advertising. 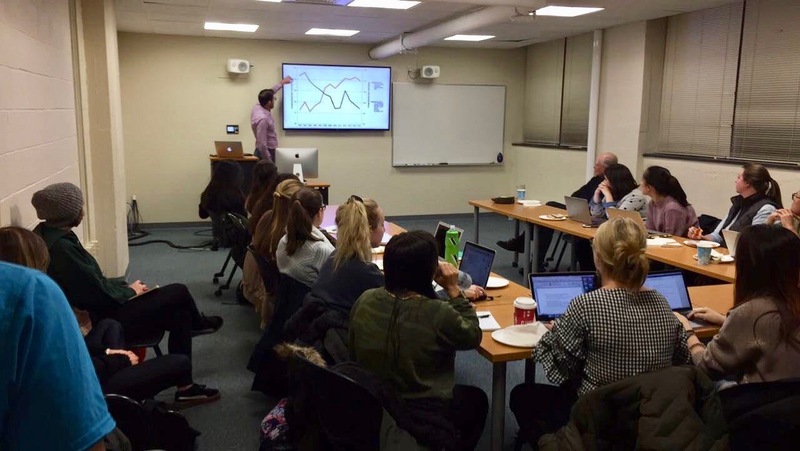 On Tuesday, November 28, the BU COMmunicator hosted its first speaker event of the year with special guest Brad Blake, Senior Vice President of Digital Strategy at Hill Holliday. The event focused on the seismic shifts occurring in the advertising world: Online advertising spending is surpassing television, mobile usage is increasing, social media platforms are offering new features; however, attention spans are shrinking and ad blocking is on the rise. Blake’s discussion highlighted three trends in digital marketing: growth and evolution of digital and social, growth in content creation and content creators and growth in data and targeting options. Each of these trends present different challenges for advertisers, encouraging them to further investigate why these changes are occurring and what advertisers and communicators can do about it. Multiple social platforms makes it a challenge for advertisers to reach target audiences. Blake shows a visual, line chart of the drastic changes in advertising. “The lines are starting to blur between social, digital and television,” Blake said. Hill Holliday, a full-service marketing and communications agency based in Boston, where Blake works with brands on their digital and social media marketing programs, customer care, employee advocacy and training. According to the 2017 Meeker Trends Report, digital ad spending surpassed television ad spending for the first time ever. In addition, by 2020, video on the internet is expected to eat up over two-thirds of web traffic. “Video. Video. Video,” is what Blake says is the future of web traffic on the internet. With video on the rise, advertisers are finding a new way to reach their audiences through videos on the Internet and social media platforms. 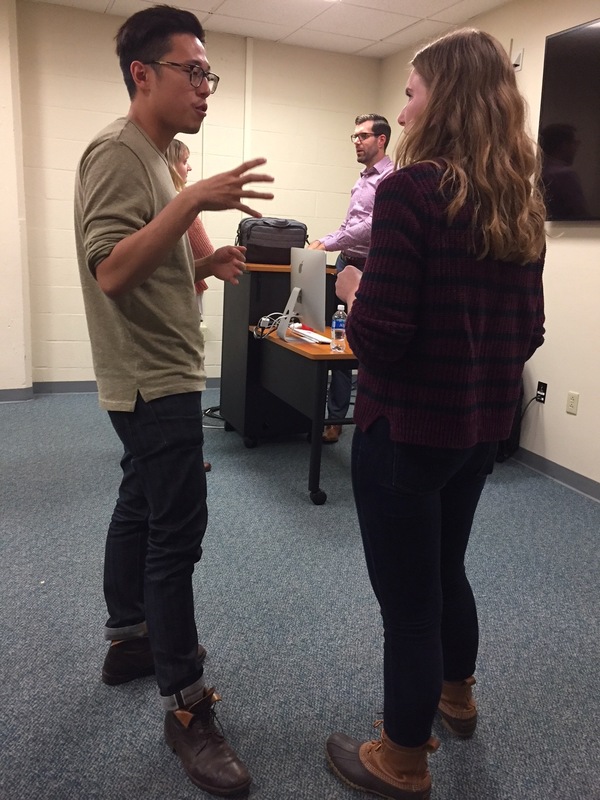 During the presentation, one student asked about how the online ad business is affected by users’s liberty to now “skip” ads to get to the content they are after, giving the example of YouTube videos. Curious to share their predictions of the advertising industry, students wait in line to speak with Blake after his presentation. While this creates a problem for advertisers, Blake says that the best practice for getting your intended audiences to watch your content is to understand exactly who you’re talking to. He also pointed out that knowing what social platforms the audience is using and identifying key takeaways from communicating with them will help create relevant content and reach the target audiences. “We’re all content creators,” says Blake, and in a world where content creators and influencers are becoming more important, content has to be specifically tailored to audiences. This means that social platforms and websites, too, are creating their own content. Facebook, for example, is now partnering with brands like Buzzfeed to produce their own video content for the site. Facebook has also introduced mid-roll advertising, short ads that come in the middle of videos. With mid-roll, content has to be as relevant and tailored as possible, further emphasizing Blake’s point about knowing and understanding your target audiences. Brittany is from Lewiston, Maine and is currently studying public relations at COM. She is planning on graduating after this semester and is set to participate in the Disney College Program in Spring 2018. When not writing or studying, Brittany enjoys running, yoga, reading, binge-watching Netflix and petting dogs (especially hers).